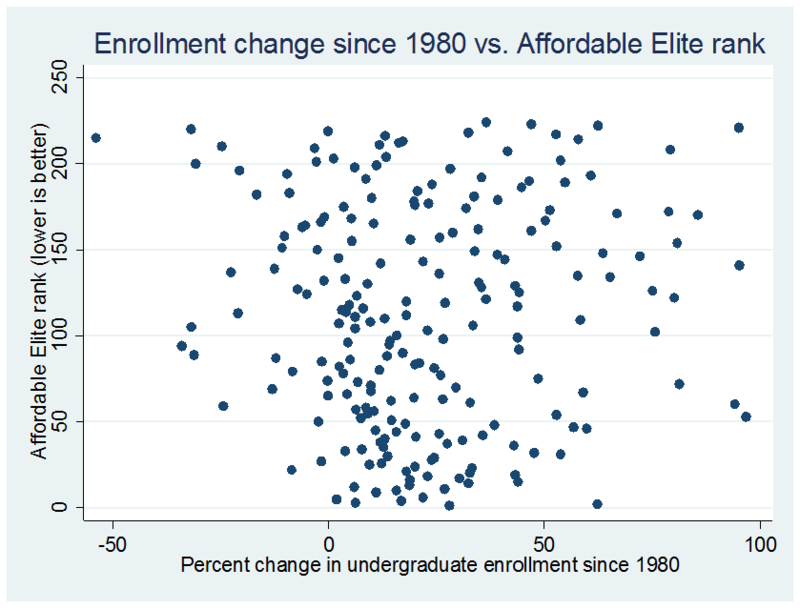 Are “Affordable Elite” Colleges Growing in Size, or Just Selectivity? A new addition to this year’s Washington Monthly college guide is a ranking of “Affordable Elite” colleges. Given that many students and families (rightly or wrongly) focus on trying to get into the most selective colleges, we decided to create a special set of rankings covering only the 224 most highly-competitive colleges in the country (as defined by Barron’s). Colleges are assigned scores based on student loan default rates, graduation rates, graduation rate performance, the percentage of students receiving Pell Grants, and the net price of attendance. UCLA, Harvard, and Williams made the top three, with four University of California campuses in the top ten. While I don’t think that the size of the college should be a part of the rankings, it’s certainly worth highlighting the selective colleges that have expanded over time compared to those which have remained at the same size in spite of an ever-growing applicant pool. I used undergraduate enrollment data from the fall semesters of 1980, 1990, 2000, and 2012 from IPEDS for both the 224 colleges in the Affordable Elite list and 2,193 public and private nonprofit four-year colleges not on the list. 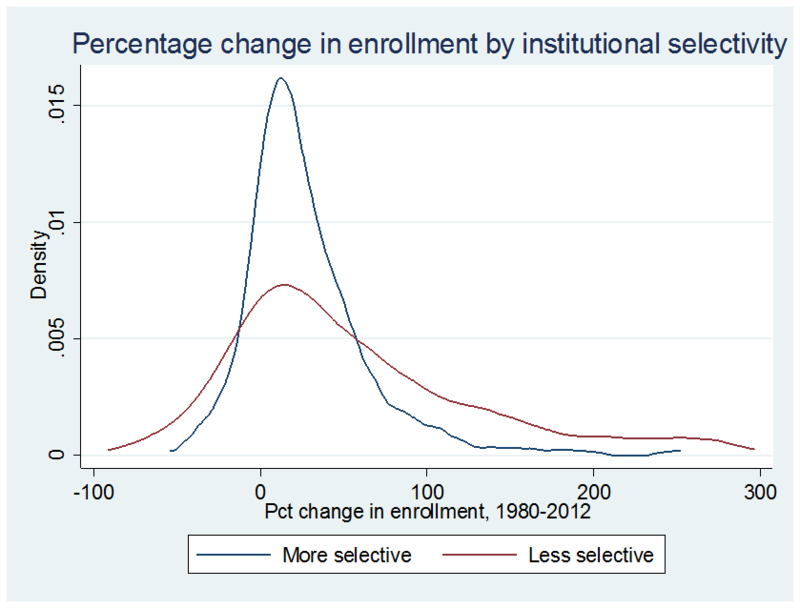 I calculated the percentage change between each year and 2012 for the selective colleges on the Affordable Elite list and the other less-selective colleges to get an idea of whether selective colleges are curtailing enrollment. So, as a whole, less-selective colleges are growing at a more rapid pace than the ones on the Affordable Elite list. But do higher-ranked elite colleges grow faster? The scatterplot below suggests not really—with a correlation of -0.081 between rank and growth, suggesting that higher-ranked colleges grow at slightly slower rates than lower-ranked colleges. Some elite colleges have not grown since 1980, including the University of Pennsylvania, MIT, Boston College, and the University of Minnesota. Public colleges have generally grown slightly faster than private colleges (the UC colleges are a prime example), but there is substantial variation in their growth. It’s not in the interest of “elite” colleges and universities to grow; it’s just algebra. If you need more enrolling, you need to admit more. And unless your applicant pool grows dramatically, you won’t stay as selective. And if you’re not selective, you won’t be elite. Previous Previous post: Are Some Elite Colleges Understating Net Prices? Next Next post: Rankings, Rankings, and More Rankings!